Sneak Previews Cats4Sale 179 - Catboat Association, Inc.
179-4. Cassiopea is a keeled Catboat modeled after Charles Wittholz' Prudence. She is 25ft on deck with a 11.5' beam. Built in 1991 near Genoa Italy, she is Mahogany plank on frame. If you’re a class boat racing fan, she won the Indian Harbor 2017 Catboat class and the Spirit of Tradition Division. and the 2017 Heritage cup Catboat class. With her wide beam she has plenty of room with 2 queen size berths. Contact Mark Mark.Williams.T@gmail.com Features: Electric windlass, 100+ feet of chain. DC refrigerator. New water heater 2016; New wireless windex 2016; New waste tank 2016; New dripless shaft seal system and new bearings; Mast stepped, stripped and varnished 2016; Navtext data Depth sounder; Raymarine tiller pilot; VHF new 2016; Stereo with bluetooth new 2016; New battery charger 2016; Pressurized water and foot pump; Repainted 2018; Alcohol stove; 37 HP diesel Lombardini 1204. REDUCED: Asking $35,000 - more pictures are HERE. 179-12. 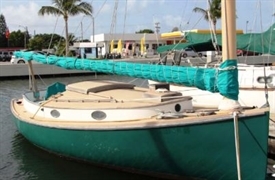 1974 Hereshoff America 18’ catboat (Nowak & Williams Co.). LOA 18' 2". LWL 17' 9". Beam 8'0". Original owner. 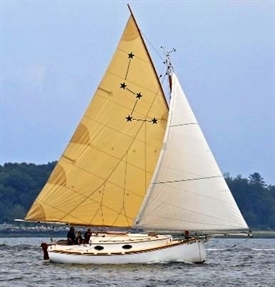 Includes sail, sail cover, steel cradle, cabin cushions, centerboard, all spars (mast, gaff, boom), boom crutch, and outboard motor (may need servicing after 3 years of storage). Original teak. Has been stored inside for winters. Located near Rochester, NY on Lake Ontario. Asking $4500 OBO. Email catboatwny@gmail.com or phone 585-442-2960 for additional details or more photos. 179-21. 1976 Marshall 22 "The Dude" Yanmar inboard diesel rebuilt in 2014. All new rigging and new radio also in 2014. Tanbark sail. New mast and new stereo in 2015. Sunbrella sail cover and dodger. Excellent condition overall. REDUCED to $15,000 or BO. In Barrington RI currently. Contact John Coen at jcoen1@me.com or 617 571-8938. 179-33. 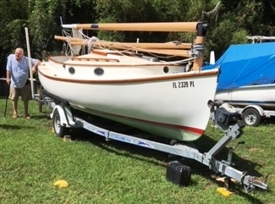 1969 Marshall Kit 22" Catboat Dulcinea. 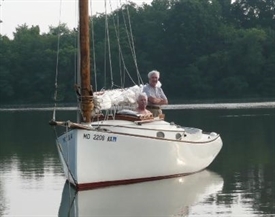 She began as a dream.... ACTUALLY owning a Marshall Catboat! Engineering and metal know-how of my Dad and brother helped customize boat. We made stainless hinges; forged jackstay bow piece and larger blocks that make sail hauling easier. The keel was FILLED WITH fiberglass and has Styrofoam flotation. Breck Marshall recommended an Albin AD-2 Swedish Diesel believing its 546 lbs the right ballast for rough waters of Barnegat Inlet, NJ. It proved to be an excellent choice proved by many years of reliable starting and running; also helped with freshwater cooling and diligent engine maintenance. Spare filters, impellers, and an extra Jabsco water pump are included. Two 15 gallon stainless tanks supply fuel and water. 179-34. 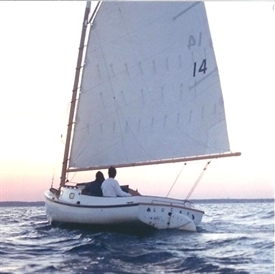 1974 Herreshoff America 18' catboat. Builder: Nowak and Williams, Co. Boat located in Duluth MN. Two sails, original flag and 2016 Quantum all white. New Thurston sail cover. Cockpit cover. Custom teak cabin floor. Electrical system with switching panel for navigation lights, interior lights, cabin fan, sink faucet water pump and bilge pump. All teak in good condition with Cetol. Dependable two stroke 1996 Johnson 9.9 hp outboard. Good solid boat ready for the 2019 season; comes with a Load Rite trailer. $7000. Phone 651-226-1059. Email bobnich@icloud.com. Sailing videos from last summer available. 179-35. For Sale: 1990 Barnstable Cat Boat. Fiberglass-hulled Beetle Cat replica. 12’4” x 6’ with fir spars, oak trim, bronze fittings, galvanized trailer, motor bracket, cockpit cover and more. Built by Howard Boats, hull 46. A desirable, iconic classic in great condition for $9,750. Also available: 2hp Honda for $550. Located in NE Ohio. Contact Eric at kretzmann4@yahoo.com. 440-222-2477. Submissions have not been approved for viewing.